Doris Korda, spent the first 15 years of her career in the high-tech industry and is now the Associate Head of School. Natasha Chornesky, who ran a publishing business, is the Director of Entrepreneurial Studies. They both attended our latest Lean LaunchPad Educators Class. These two posts are what they did when they returned. 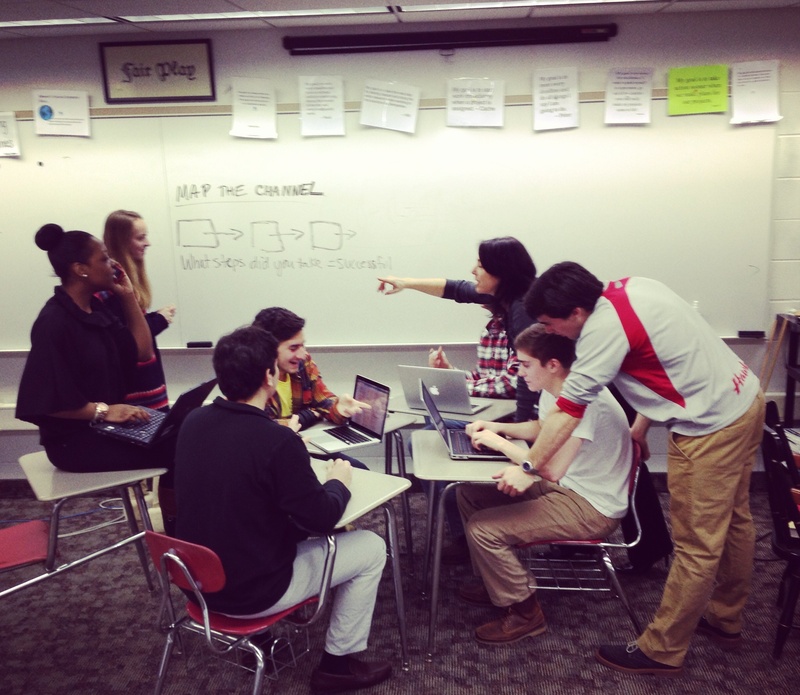 Part one is about Hawken School’s experience using the Lean LaunchPad curriculum for high school seniors, part two is what happened when they used it for 6th- to 8th-graders. Having taught grades 6-12, survived two “tours of duty” as a middle school principal, and designed curriculum for grades 3 and up, it was obvious to me that Steve’s Lean LaunchPad provides an accessible framework for young students to search successfully. We started with a few hypotheses, and iterated and pivoted to a successful program. High school students will come through the door burning with passion to transform an idea into a business. Reality: My seniors arrived to class with no ideas and no idea that they needed an idea. They thought they were learning about other people’s ideas in case studies and articles. They didn’t think they’d be doing entrepreneurship. Practice: We created time in class to share ideas. I framed the search for a viable business model as the focus. We determined as a class that we wouldn’t pass judgment on ideas until we dove into the customer development process. I stressed to the students they would be assessed on their ability to move through the Customer Development process, rather than be graded on an idea’s perceived worth. How quickly can you test hypotheses, learn from the tests, iterate? Currency in my class became the ability to quickly test hypotheses, iterate and pivot. It would be several months before my seniors, obsessed with college admissions, embraced this methodology, which felt so foreign at the onset. Still apprehensive about working on their own businesses, I connected them with local entrepreneurs, but with a twist. Following Steve’s Golden Rule that entrepreneurs were not allowed as guest speakers in class, I went out to the community and located entrepreneurs who needed help with their customer discovery process. I worked with the entrepreneurs to craft a deliverable that was both helpful to them and with which my students would be successful. One of the requirements was that my students had to get out of the building and start talking to customers. Students blogged using Steve’s four prompts, below. The more they were out in the field, the stronger their entrepreneurial mindset grew, which was reflected in their posts. Result: By the end of the first semester, the world opened up, questions and opportunities popped up everywhere, even where kids previously had seen failure or disappointment. Students’ entrepreneurial mindsets had permeated the most unlikely places. “I don’t know what is going on in your class, but these kids have changed. Their entire mindset is different and the way they are showing up in the college admissions process is really different—in a great way,” remarked Director of College Admissions, Andrea Hays. Hawken’s entrepreneurship class needed to look and feel familiar to students, parents and others in order to be successful. Reality: A local school that is held as the pinnacle of entrepreneurship education uses Harvard case studies, so I thought we should, too. We were three-quarters of the way through the year and we hadn’t touched one. We didn’t need them. The customer discovery and development process provides real experience, and real experience trumps case studies. Plus, kids will tell you that the cases are the same old problems and they’ve already been solved. Reading and discussing problems is never as meaningful as experiencing the problem, which can only be achieved by getting out of the building. Practice: Throughout the entire first semester, I maintained a routine of weekly take-home quizzes. Quiz questions asked students to use their favorite businesses to flush out business models using the Business Model Canvas. While the students aced these quizzes, they quickly forgot the information. Iteration: I “flipped the classroom” by switched from assigning chapters to read to assigning Steve’s Udacity videos. Understanding, enthusiasm and retention increased. I abandoned the weekly quizzes and instituted weekly “here’s what I learned for customer discovery” presentations from the students , followed with a class Q&A session. The presentations demonstrated their hypotheses tested, results, customer interactions and iterations. I graded the presentations and I graded the verbal feedback students offered one another. When the quality of the verbal feedback became such that there was too much great information for kids to just remember, I introduced the use of Steve’s live feedback through Google Docs. At first my seniors giggled and snickered and told me I was nuts to put this tool in their hands. We talked about the value of immediate meaningful feedback. They quit giggling. We’re never going back. The quality of feedback and the quality of the presentations has increased exponentially. “I opened up the Google Doc to review the commentary from my classmates about the slide decks. The variety, complexity and creativity of ideas were impressive. Some people touched on concepts that our four-person group hadn’t even thought to consider. There really is strength in numbers,” writes a senior in her blog. What’s next: Having completed in-depth customer discovery my students will be the first to tell you that “Being an entrepreneur is a TON of work!” Returning from spring break, the entire class will break up into teams and commence their own search for a viable business model for a passion-driven idea. It’s going to be dirty, messy and lots of time outside the building. 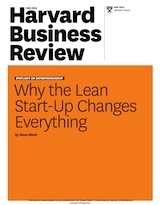 The Lean LaunchPad methodology is proven. Go 100% from the start. Don’t phase it in. Be transparent with your students. 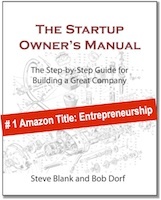 Your class is in Startup mode. Embrace failure. Kids have less to “unlearn” than older students and they are naturally excited by Lean LaunchPad 100% experiential methodology. Be clear in your mind that the skills acquired through Lean LaunchPad methodology trump content and act accordingly. Act tough, too. Remind kids that they are being assessed on how quickly they learn from testing their hypotheses and how quickly they iterate and pivot. Leverage your local entrepreneurship community in meaningful ways, instead of using them as guest speakers. In the next post, 6-8th graders use the Lean LaunchPad at Hawken School. That is just good design. This is fantastic. As a teacher I feel very beaten down by how often administrators and politicians keep on piling on tasks instead of streamlining and making things more efficient. You’d be interested in what’s going on at the ICE education conference here in Illinois. There are some innovators working on these things in Illinois. Serendipity? My name is Deborah Blank, and my father-in-law was Steven Blank of San Fernando, California (born in New York City). I don�t think you were related to him, but who knows?!!!! In any event, I�m contacting you to explore adaptation of your curriculum for a non-profit group that I work with as a volunteer: Empowered Women International (www.ewint.org) in the Washington D.C. area. EWI helps immigrant women start businesses based on their talents and passions. The businesses are non-technical, at least to date � including food preparation, cleaning services, handicraft design, photography, and healthcare related services. In conjunction with entrepreneurial concepts we teach financial empowerment, and also provide one-to-one mentors from the business community. As you can imagine, many of our students come to our entrepreneurship course with little or no business experience, and some have personal challenges as well, including past abuse, language barriers, etc. Our current course, Entrepreneur Training for Success (ETS) is an intense 3 month program which culminates in a business plan. We are developing a follow-on 9 month course entitled Grow My Business which focuses on customers, products/services, channels, marketing, pricing and sales. The course will help graduates of ETS execute and refine (pivoting where research indicates) their business plans. It was during my research for this course that I discovered you. Imagine my excitement at finding the Udacity course and the Business Model Canvas which I can assign as �homework� and leverage off of for our seminars. I am 100% aboard with your ideas, as they reflect my personal experience in business. 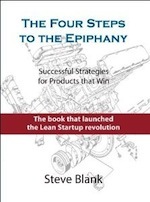 1) 1) Do you know of any other program like EWI�s that has adapted the Lean Start-Up concepts/curriculum for a similar population? 2) 2) (And I hate to ask this�.) Are there any scholarships to your Educator�s Conference? As a non-profit, we�re always in “ask” mode. I would love to attend, and could, if it would be helpful, lead a small group brainstorming session for folks who want to adapt the program for micro-enterprise training aimed at non-technical startups. In other words, I�d try to help out to earn my tuition! I apologize for this lengthy e-mail, and hope you are still reading. If you are in NYC (?) or have plans to be in D.C. I’d be happy to hop on a train and visit you in person for a conversation. Is there a particular format to “Steve’s ‘Live Feedback’ Google Doc” mentioned above? I looked in the ‘Running List of Resources’-thought I’d check to see if there was any additional information I could ‘glean’ based on how it was used in a k-12 student setting. I am currently using the live feedback for the weekly slidedeck presentations. It’s super easy–just a google spreadsheet with attendance. Then below that, each team name. Under each team name is a list of all the students/mentors. Next to that rank (scale 1-5 for presentation strength) and next to that plenty of space for comments. Shoot me an email at nchor@hawken.edu, if you’d like a link to one of our google docs. We’ll be using LaunchPad Central for our next batch of students, who start a three-week intensive in May. This is exactly what I thought needed to happen. Bravo! It appears to me that most people in the US do not understand how business works. I am so happy to see this. Kids in high school are so exciting when they are allowed to move forward in a positive, constructive way. Yay! Please checkout http://www.bvcaps.org where juniors and seniors in high school are doing ideation, proto-typing, proof of concept and commercialization.. We have 390 mentors that are helping students learn the processes of entrepreneurship. What a great post and story!!! Starting the entrepreneurial “education” earlier (grade school and HS) can only lead to more successful entrepreneurs and companies and perhaps more importantly, people/humans that can actually think and act for themselves. They will see opportunities everywhere and understand how to convert those into successful companies. Economic growth at its best!!! I’d like to see elements of the methodology taken all the way down to kindergarten. Seriously. The younger the kids, the less they have to “unlearn.” Overcoming, accepting and learning from failure come naturally to young children. The methodology supports this and encourages the development of empathy, both which are essential to successful adult lives no matter what a child ends up pursuing in life. Yes, we want to tailor this curriculum to our youngest. In age appropriate ways, we can use customer development (understanding pain and gain of others) to develop empathy, and productive failure to develop resilience. Stop teaching kids customer development. Its a bad idea. It will be harder for the rest of us to make easy money in a few years. Stop wishing and just do it if it really matters to you. Start with subtitles. I have a lot of Spanish friends. They are used to subtitles. And if it fails, u can just read from the subtitles and add a Spanish voice over. The cost of having a freelancer download the udacity videos, cut out steves voice, add yours and upload it to youtube wouldnt cost more than $50 dollars. Larry, Thanks for the comment. Spanish subtitles are already in place for the Lean Launchpad videos but it will be hard for secondary school students in Spain to follow the images. This is only a wish for me because I am not directly involved in teaching and I have a lot of work to keep my company floating these days of deep economic crisis. However, I believe the experience in the Cleveland Schoold would be very beneficial to the future of the economy in Spain and I will be alert to opportunities to propose a similar experience to people here who could implement it. Absolutely LOVE this post. I believe every student should be taught to be an entrepreneur. Why settle for anything less than what you may be capable of? I never understood that. Shoot for the starts and if all else fails, then you can “settle” for a 9-5 job.